Pat the Hat Smells a Rat | SPACE-BIFF! Originally, the plan was to write up a whole series on Omerta: City of Gangsters. Not a long one, maybe three or four entries, but a series nonetheless. But between Pat the Hat’s early misadventures and the few hours afterwards, I think it’s safe to say that Omerta well of surprises has run dry. Which means that the tale of what happened to Pat after his crew locked down Maine Avenue and started shooting for the bigtime — well, it’s also Pat’s last adventure. 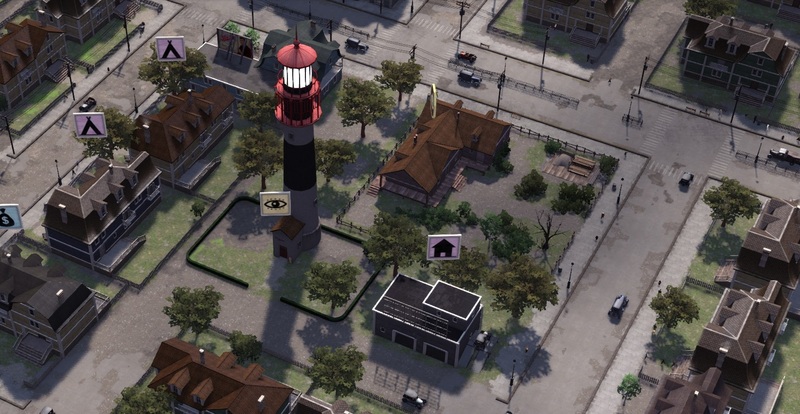 The gang’s new turf: Absecon Lighthouse. Maine Avenue is firmly in the control of Pat the Hat’s crew, not that it will provide any bonuses or favors now that Pat has relocated his gang wholesale up to Absecon Lighthouse, a well-to-do neighborhood known for its scenic and touristy namesake, a lighthouse. Hey, Pat likes to keep things compartmentalized, even though Squigs and the new recruit Doc (a perpetually drunk Irishman, imagine that) like to point out that their expansion efforts could sure use some of that dough from over on Maine. Pat refuses; “Four grand should be enough,” he keeps telling them, “to get our feet on the ground, and our beaks wet.” So Pat rents a hideout in the most inconspicuous location possible: right at the base of the lighthouse. Fun as it was to send Squigs out to rob all the breweries and get kidnapped and such, the first order of business is to set up some stills of their own. Pat’s consigliere, Freddie Tanino, explains that the best way to do that is to rent the nearby premises, which in this case is the garage next door. Pat charges out the front door to do just that, and after a few minutes of negotiation (rent is a one-time fee of four hundred dollars of un-laundered money) and then an afternoon of setting up stills, the gang has their very own brewery. Next, Tanino says we need a speakeasy to sell all that booze. Pat points out that there’s another premises nearby, and he prepares to sprint off, but Tanino interrupts him: another premises just won’t do — premises are only good for setting up breweries, distilleries, counterfeiters, smugglers, soup kitchens, and the like. What they need for a speakeasy is a joint, where we can hide stuff like ponzi schemes, protection rackets, pizzerias, pharmacies, and of course, speakeasies. Can you guess which one houses a boxing arena? Neither can Pat. “Premises, of course, you dummy!” bellows Tanino. Pat stumbles out the door, head still spinning at the subtle differentiation between premises and joint. Not that it turns out to matter much. The owner of the joint is willing to sell for the same price that the owner of the premises sold, and in a few hours we’ve got an operating speakeasy, open for customers. Hooray for the American Dream! Huh, could it really be that easy? Sure enough, Doc walks over and offers to buy the place. They’re not interested since they think we’re mooks for opening our own speakeasy-brewery combo, but as soon as we deliver a few cases of our (competing) label, they’re so elated that they throw open their doors and sell out for a few hundred bucks. There are some other elements in town not too happy at the pace with which three immigrants have gone from fresh off the boat to major neighborhood powers, but none of them are willing to do anything about it other than give our boys grumpy looks as they sprint around town. At least until Louie Castaneda shows up and informs us that those punks we wiped out over on Maine Avenue were in deep with him, and we’ve now inherited their debt. Um… how about no? The game doesn’t give us any option to refuse, so now Pat is forced to go along with Squigs and Doc to murder some people. Doc clears out the place. Squigs might get jealous with how easily Doc handles the poor bastards. 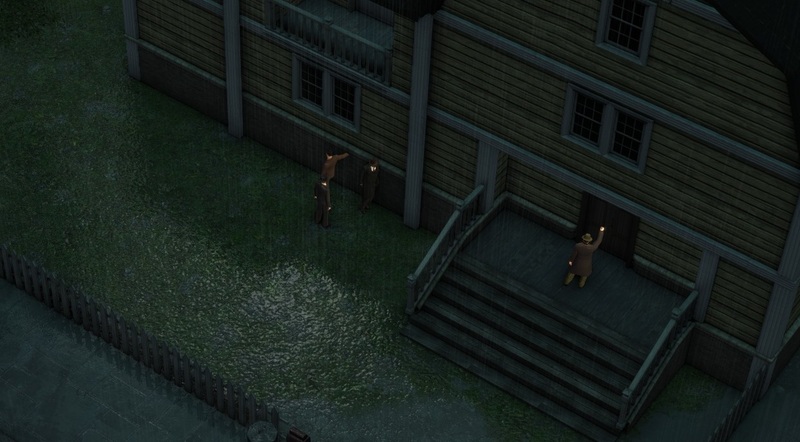 All he has to do is sit behind a crate and gun everyone down with his two revolvers as they bumble out the front door. Since he doesn’t ever need to reload, or worry about real tactical considerations, or even pay much attention, the situation nearly handles itself. Unfortunately, Louie informs the boys that they’re still operating on his turf, so they’re his errand boys from now on, which is a huge step back for Pat the Hat, who was pretty darn proud of having skipped the goon phase of gangster life. And Louis isn’t even going to help out with the fallout from the shooting, which has attracted the attention of the cops. It’s a relief then that we can pin the crime on the owner of our final speakeasy competitor. The police just believe us, apparently; and if we’re planting evidence or something, it’s the cheapest job ever, requiring no bribes or even a discarded murder weapon. In fact, it turns out that it’s functionally impossible to lose the game at all. 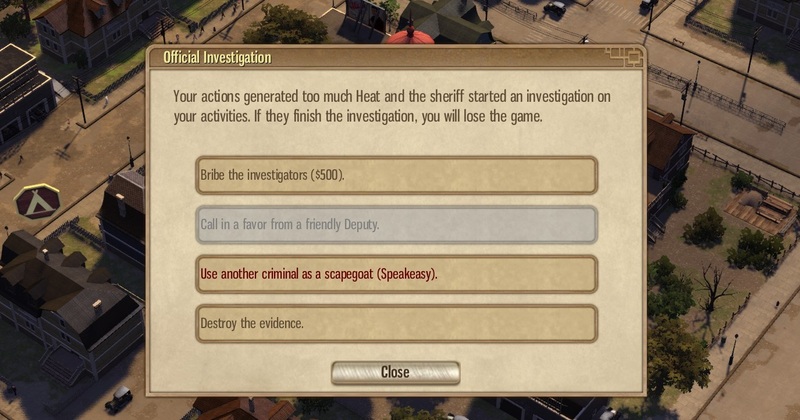 You can pay off the investigators, have a friendly deputy vouch for you, or keep scapegoating your crimes forever. The only way you’re going to jail is if you don’t have any of those options — and five hundred bucks of dirty money is ridiculously easy scratch to earn. Is the only way to lose to keep playing? Because that’s how it’s starting to feel. Look, I’m not expecting gangster simulation nirvana here, but Omerta is getting worse with every passing minute. I’m not leading a gang; I’m just clicking on gang-themed sentences while listening to unconvincing accents and okay jazz. The theme could be swapped for anything else — like, say, running a restaurant empire — and all it would require is different descriptions for the actions, resources, and characters — mushrooms instead of guns, booze stays booze, chefs with stereotypical accents instead of mobsters with stereotypical accents, etc. 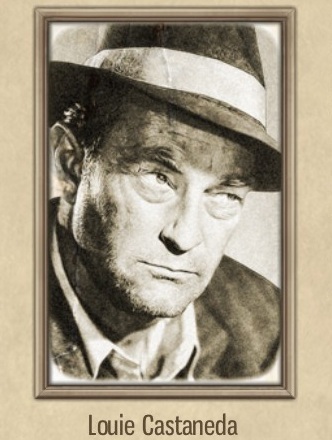 There’s no actual threat other than the possibility of needing to sit around for a few extra minutes as cash trickles in, since enemy gangs and speakeasy owners get “cold” when you repeatedly attack their businesses rather than going to the mattresses or murdering your guys when they’re out on the town. Another thing that bothers me is how whitewashed this version of gangland America is. It’s not that I necessarily want to have my gang dabble in dope and prostitution and the dark details of protection rackets, but — okay, you know what? Maybe I do. This is fiction dealing with a mature subject, and it’s okay for a game to engage on that level. After all, the characters regularly commit murder, including against cops and bystanders, and there’s all sorts of other lawbreaking and wicked tomfoolery going on. That’s what you expect when you buy a game about gangsters. And at the very least the inclusion of sticky topics like human and drug trafficking could introduce some ethical conflicts, like the actual historical Prohibition clash between old guard mobsters and their younger and brasher underbosses. This period is ripe with opportunities like that, just waiting to be tapped. I realize there are probably rating concerns with what I’ve just proposed, but it’s easy to see how a gangster sim could be compelling and interesting. This is just… there. Present. Taking up space. 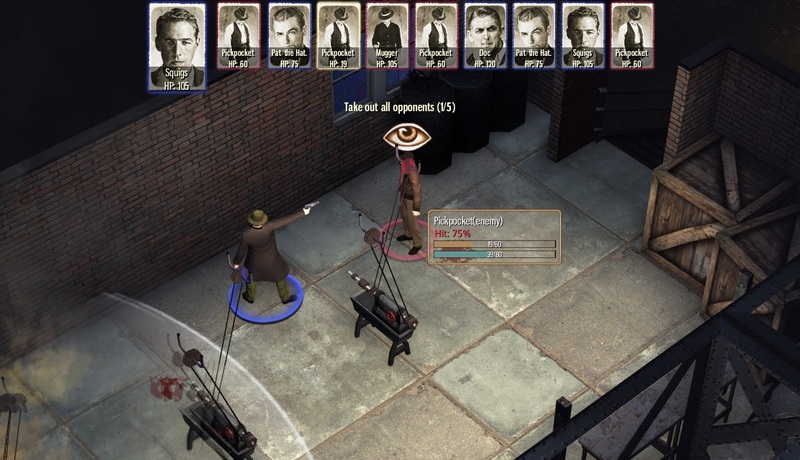 But my main problem with Omerta hasn’t even reared its ugly head yet. Now in the employ of Louie, Pat the Hat relocates his gang to Gardner Basin, where his goal is to figure out a way to acquire the massive confiscated stock of a former liquor baron. It sounds interesting enough, but as soon as the mission begins, Pat’s consigliere explains how they’re going to go about it… by opening some distilleries! And renting some joints and premises! And sitting around until they provide enough cash to rent more spots to build more businesses! And occasionally fighting a tactically-dead turn-based battle! Once that’s handled (and Louie takes his massive cut), it’s time to break into Northside by wiping out the KKK. That seems a noble goal, best accomplished with some premises and joints. Then Louie informs us that we’re heading to Baltic Avenue to take out his competition. By fighting them in horrible battles, after renting premises and joints. You don’t have to be John Nash to see an emerging pattern here. And therein lies the true rot at the heart of Omerta: after it teaches you all the basic stuff, you’re always playing the same waiting game. And nothing has changed. And nothing ever will. Squigs wins his 19th gunfight. At least the game throws me a bone. Turns out Louie Castaneda is a rat, and all his petty errands for Pat’s gang has led up to an attempted hit on the real mob boss. 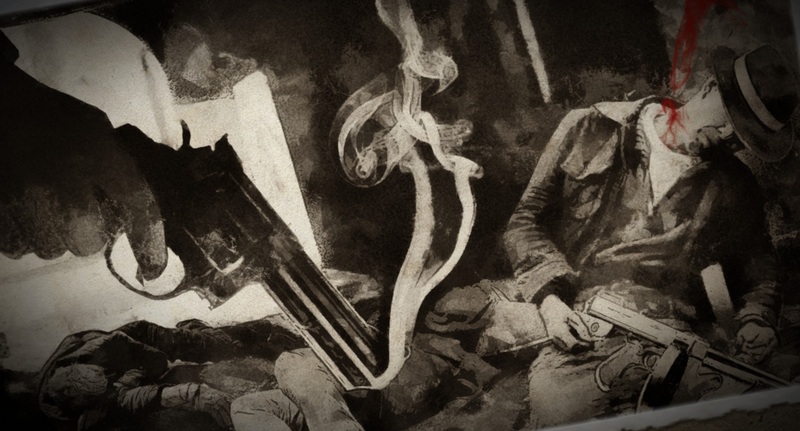 Pat suddenly sees a way to blow two joints with one molotov, getting out from under Louie’s thumb and into a made man’s good graces all at once. So he and the gang head over to Virginia Avenue to lend a helping hand. Of course, we can’t go straight to the climactic showdown right away — first we need some premises and joints. After our local finances have been put in order, it’s time to help the godfather from getting whacked. 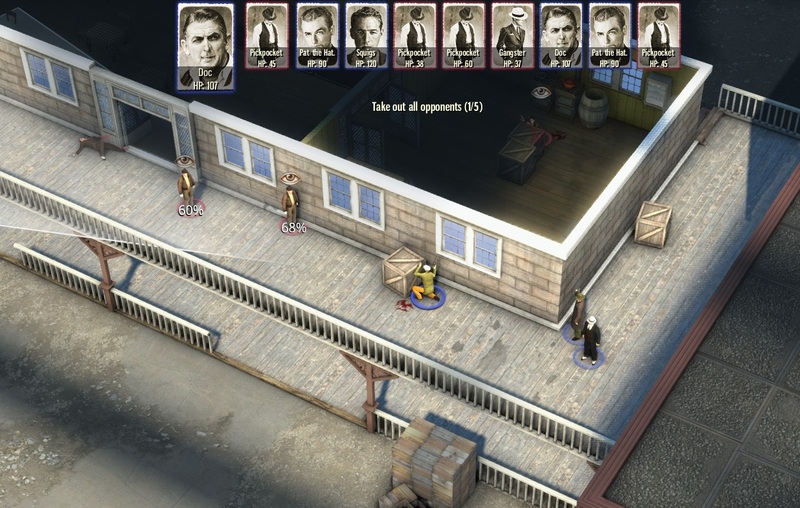 This battle is sadly indicative of every fight that has come before — as my guys take cover and take potshots at the enemy, the mob boss runs out to beat his assailants to death and his own bodyguards riddle him full of holes from behind. He lives, though barely. At least he’s grateful enough that he offers me a position as an underboss. “No thanks,” I imagine Pat the Hat saying, flashing that handsome smile of his. After five hours of waiting for the game to start, I’m through. After all, the twist ending (and the moral of the story) is that Pat the Hat did indeed smell a rat — but it wasn’t Louie Castaneda he smelled. 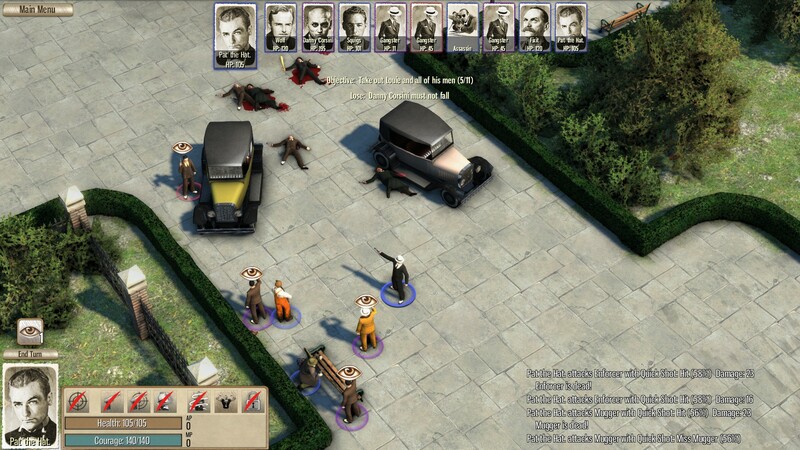 Posted on February 26, 2013, in Game Diary, Reviews and tagged Kalypso Media, Omerta: City of Gangsters. Bookmark the permalink. 7 Comments. Happy to help you not buy this trash! Bummer deal. Poor Pat. Trapped forever in gangster gaming hell. Do you know about any worthwhile gangster games? Of course. Problem is, there aren’t any worthwhile *sim-level* gangster games. At least as far as I’m aware. Other than that, I’m a fan of both Mafia games. The first is better, but it’s harder to get into (old). Pingback: Pat the Hat Makes a Buck | SPACE-BIFF!